NRU Co-founder and CEO Jim Piccolo, Heather Grossman and her assistant. Special Guest Heather Grossman, a mother, mentor, survivor of domestic violence, winner of the Ms. Wheelchair Arizona Pageant, and first runner up in the Ms. 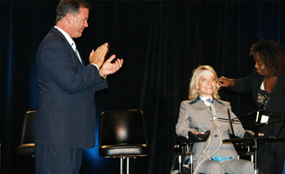 Wheelchair America Pageant, shared her heart-warming, amazing story of tenacity, unfortunate circumstances, overcoming the odds, and her devotion to changing others’ lives. In the spirit of giving back, NRU sponsored Ms. Grossman in the Ms. Wheelchair America Pageant, where she competed against amazing women from across the country.